Larne manager Tiernan Lynch says his side are "buzzing" to welcome Coleraine to Inver Park on Friday night in the Irish Cup quarter-final. The last eight tie, which will be shown live on BBC Two NI, pits the runaway Championship leaders against the Cup holders. "Coleraine are a top side but we want to be involved in these big games, this is part of our journey," said Lynch. "We have a good squad and a lot of good players." The Inver Reds are within touching distance of securing promotion to the Premiership as they hold an 18 point lead over second-placed Carrick Rangers with just six games remaining. Having dominated their league, Friday's game against Premiership stalwarts Coleraine will provide Larne with an example of the calibre of opposition they will come up against next season should they achieve promotion. "It is an amazing place to be, the town is absolutely buzzing," Lynch added. You can see when you are in the changing room or in and around the club, everybody involved is absolutely buzzing with what is going on. 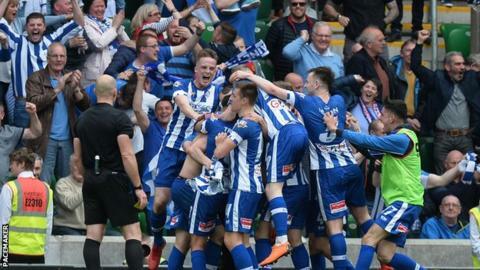 The Bannsiders defeated Cliftonville last May to lift the cup for the first time in 15 years but have struggled for consistency in the Premiership this season. "A Friday night game under the lights, and an Irish Cup quarter-final, is always one to look forward to," said boss Rodney McAree. "They are very well drilled and coached by Tiernan and Seamus Lynch and Tim McCann. They have good men at the helm and they try to play the game the right way in my opinion." Five Premiership sides have made it through to the last eight along with Larne, Ballinamallard United and Amateur League team Larne Tech Old Boys.